China’s relationship with Pakistan is long and enduring, but rather than one built on trade and investment it has traditionally been a political relationship centred on a mutual distrust of India. The Chinese are building a new port in Gwadar; which many to believe to be part of a Chinese naval expansion as they attempt to build a “string of pearls”, a series of bases in friendly countries like Sri Lanka and Myanmar allowing greater control over the shipping lanes of the Indian Ocean, which are vital for its success as a trading nation. However so far there is little evidence of these naval bases being developed for military use and port construction is geared towards purely commercial use. The two countries also trade by land, via the spectacular Karakoram highway which tenuously connects Xinjiang in China and Gilgit in Pakistan. While trade between the two nations has grown enormously, Pakistani businessmen have accused China of dumping textile products on the country, undercutting local producers and destroying a mainstay of the economy. Pakistan wants to redress the balance by exporting more to China, but with Chinese goods produced so competitively, this will be no easy feat. China has also invested heavily in its Southern neighbour, such as providing fibre optic cables for the country’s cities, as well as improving roads and rail networks. The relationship between China and India has been dominated by political rivalry as well as their common belief that they should be the foremost power in Asia. This has manifested itself in border disputes and arguments over Tibet, which have clouded relations for many years. Now ties have improved and trade, previously miniscule, has taken off in a big way, increasing by 500% in the last decade. 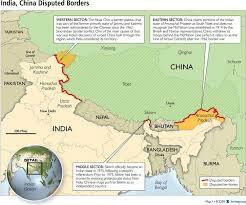 However these new economic ties have sparked new tensions, as the trade is heavily in favour of China. India has been purchasing large amounts of Chinese machinery and consumer products, but lacks the quality goods, or natural resources that China demands save its ample iron ore supplies, so is facing major problems in exporting in great numbers, leading to grumbles from Indian businesses and government. On the positive side the two countries have collaborated via the BRICS forum, which if institutionalised through a development bank could become a serious force in international finance, but also strengthen Sino-Indian relations. India has become a big investor in Africa, following in China’s footsteps; Indian companies have been active in natural resources, financial services and telecommunications. There is a large Indian diaspora, particularly in ex-British colonies that has helped to facilitate this expansion. The Indian approach to overseas expansion is laissez-faire, dominated by private companies in search of profit, which provides an interesting contrast with the Chinese state owned companies who often have a strategic aim in mind, as well as the strong backing of the government. Bangladesh has seen its low garment and textile manufacturing industry take off in a big way, becoming a major exporter of cheap clothing to the EU. Now the “Made in Bangladesh” label can been seen right across the high street in fashion chains such Swedish owned H&M or Primark. Rising costs in China should help ensure more factories move to the densely populated but flood prone country. China has also seen its bilateral trade with the country rapidly increase over recent years, which remains heavily in Beijing’s favour. Bangladesh imports machinery, electronic goods and other finished products, while it exports raw materials like fish, leather and cotton. China has reduced tariffs on many Bangladeshi products in order to help redress the balance of trade. China has become a heavy investor in Sri Lanka, most notably in the redevelopment of the Port of Hambantota. The Chinese EXIM bank has backed the construction of a major new shipping logistics hub, which plans to tap into the large number of container ships which pass close to the island on their way from Singapore to the Suez canal. The Chinese have also been active in building new motorways on the island, including one from the capital Colombo to the tourist areas in the south of the country. Like Mongolia this country is sandwiched between two giant neighbours and has made the best of its geographical position. Economically it remains closer to India, as access to the part of the country is relatively straightforward whereas China is cut off by the Himalayan range. Politically Nepal steers a path between the two countries, ensuring friendly relations with both. India provides Nepal with its oil supplies and other essentials, in return it is ensured that the country is open for Indian investment. De-facto part of India, this isolated kingdom has tentatively opened up to the rest of the world, and has promoted the fact that is has the world’s happiest population. How the Bhutanese will adapt to its increasing exposure to other cultures remains to be seen.